The Harlem Globetrotters were in town last weekend and put on a show for fifth graders from Roxbury’s Emerson Elementary at the new Ray and Joan Kroc Corps Community Center in Dorchester’s Upham’s Corner neighborhood. 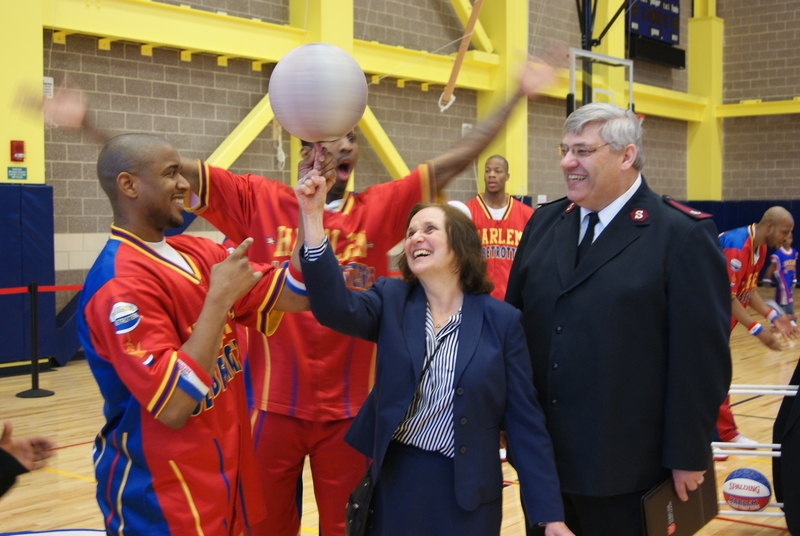 Pictured at right are the Globetrotters giving some basketball tips to Emerson principal Dr. Vivian Swoboda and Major Robert Kountz of the Salvation Army. The Kroc Center, which has fitness, aquatic, health, and worship space in addition to a brand-new gymnasium, officially opens April 1. By the way, the Kroc Center official grand opening is this weekend – April 1st – 3rd. Come see a brand new community center with over 2,700 square feet on 6 acres of land in the heart of Dudley Street Neighborhood. remember me I got to go up and take a picture with the team i had a great time thank you so much. Love you all and hope your career goes great!!!!!!!!!!! !